Anti slip / Grip & Waterproof sole - Premium elastic rubber sole with deep flex groove guarantees non slip performance even if you encounter with shallow water, what's more, it can prevent scratching the floor to ensure quiet. Flat sole with arch support gives you a stable feeling and a sense of safety. Durable - Stretch knit upper will never burden you feet, resilient midsole cushioning and snug furry liner offer a wonderful walking experience. Delicate stitching and processing are not easy occurring seams or distortion. Perfect for winter and cold weather ; available for many at home/ indoor occasions such as open house, guest treat, hotel, sleeping room, dining room, living room, bedroom, etc. A good partner for people with poor circulation and a great gift choice for Christmas Day, Valentine's Day , Father's Day, Thanksgiving Day, birthday, etc. 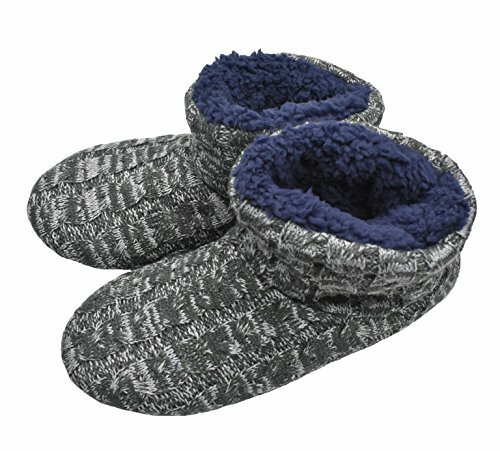 SNUG STRETCHY UPPER - Cashmere woolen knitted upper is cushioned with a layer of resilient - skin friendly cotton liner. The flexible upper never tightens or presses your feet. Side open cut makes it easy to pull on and off. Moderate thickness bring you a sufficient warm indoor. Breathable overlays and lining absorb moisture or sweat, keeping your feet comfy, deodorant and refreshing. NON SLIP & SHOCK ABSORBING SOLE - Cozy foam tread is sufficiently supportive so that make walking ultralight. soft peach ski bottom with anti slip grippers promote natural range of motion with stronger traction and frictions. Slightly elastic cushion tread with thin cotton quilted insole makes your walking lightweight and comfortable. Safe and stable motion could be promised as well. Premium outsole never scratches the floor and keep quiet. 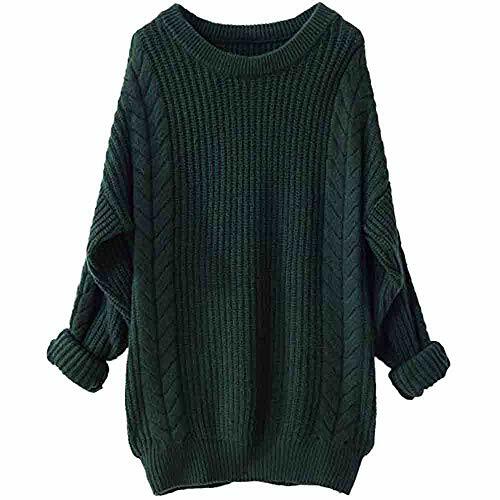 Lightweight materials, dense knitted sweater upper leads fashion trend. Elegant shape and all matching style makes it useful in many common household occasions. Densed stitching and fine processing are not easy to occurring fall apart or abscission. Cable knit upper and foldable fluffy cuff also decorate the stylish booties. A special style mixing with fashion and retro taste. Suitable for indoor and moderate outdoor use. Perfect for at home, open house, guest treat, hotel, dormitory, bedroom, living dining room, office, spa, steam room, sleeping room. A good company for people with poor circulation or moms in confinement. Available in cold weather like winter, late fall/autumn and early spring. A good gift choice Christmas Day, Valentine's Day , Mother's Day, Thanksgiving Day, birthday, etc. Snug 3 layers of padded liner - fuzzy lining is blended with resilient hollow cotton interlayer, thick sherpa fabric and comfortable shu velveeteen. All of these together with premium memory foam platform offer a cloud like comfort for your feet and absorb sweat and release odor to keep your feet warm, comfy and dry. Anti slip & waterproof sole - elastic rubber outsole features excellent non slip performance and quiet without scratching the floor. The deep flex groove under outsole adds up grip and traction. Flat bottom with arch support give you a stable feeling and a sense of safety. The comfort could be guaranteed as well even though you encounter with some shallow water. 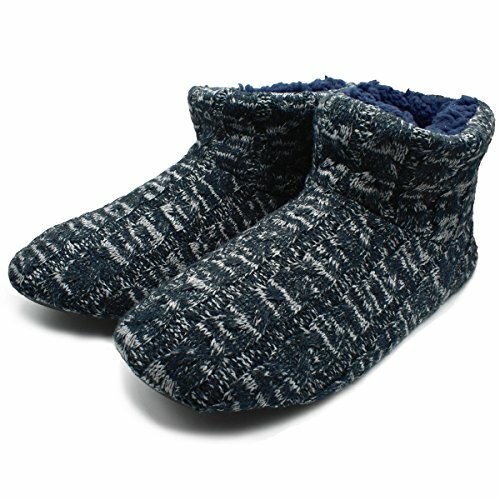 Lightweight - floppy lining with ultralight stretch yarn upper never burden your feet and offers a cozy walking. Mid calf style makes it easy to pull on and off. Slip them on and enjoy a pleasant indoor leisure time. 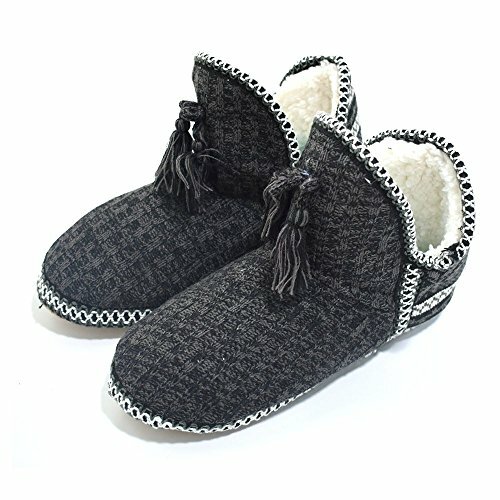 Beautiful & nice - cable knitted woolen upper, simple gray series, casual indoor slippers with flatform soft footbed eliminate your fatigue after a long day work. 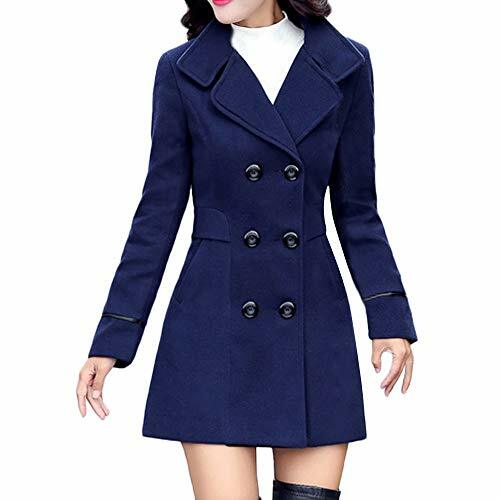 It's indeed a good home company for people with poor circulations in cold weather and good gift choice for Christmas Day, Valentine's Day , Father's Day, Thanksgiving Day, birthday, etc. Perfect for late fall and winter. Available for indoor occasions such as open house, guest treat, hotel, living dinning room, bedroom, sleeping room. Of course moderate outdoor use are allowable if you persist in. Hand washable. Please notice that right using and maintain can also prolong the lifespan - it worth it. 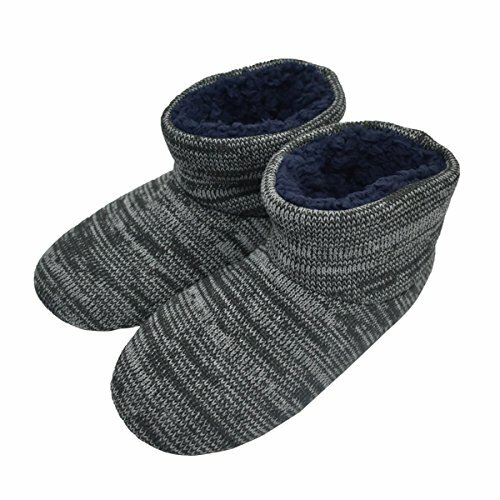 SNUG PADDING COMFORT - 2 layers of thick upper consists of wool knit overlays and soft fluffy velvet liner, giving your feet smooth and cosy touch. Midcalf ankle wrap prevents chill effectively and offer an extra warm. Flexible sweater upper never chafe against your feet due to its strong stretch. Breathable materials wick moisture and sweat effectively to keep your feet refreshing, deodorant and comfy. NON SLIP & SHOCK ABSORBING SOLE - platform rubber outsole is cushioned with memory foam midsole and floppy sherpa velvet insole, which alleviates shocks effectively. Anti skid texture under bottom adds up frictions and grip, promising a safe walk. Flat bottom with supportive soft footbed supplies aiding energy like arch support at the time of giving you stable sense. Elastic foam tread never scratches the floor or produces much noise, keeping a quiet environment and never snapping up good mood. DURABLE & ULTRALIGHT - Select high quality materials, process them delicately and finely. Resilient dense knit upper can accommodate your feet better. It's not easy occurring seams or abscission. Wear resistant rubber sole adds durability in high wear zone, and provide comfortable at ease movement. 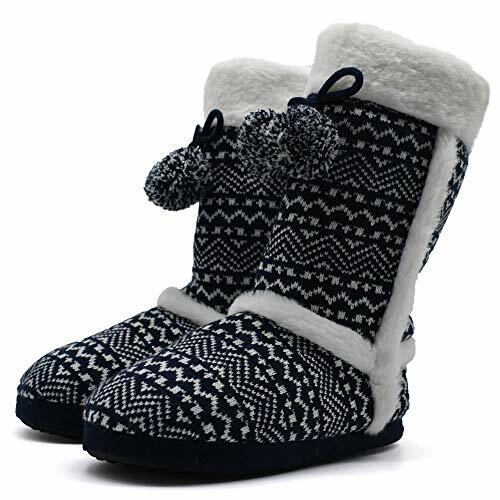 TRENDY PULL ON HOUSE SHOES - retro slipper boots shape is ornamented with contemporary popular elements like plaid, fold line or full fur lining. These colorful cute pattern promotes the stylish sense. Mixing with classic style, the cool boot type shoes leads the fashion. Foldable fuzzy cuff could make it easy on and off. Slip them on and let your feet be pampered in your casual household time. 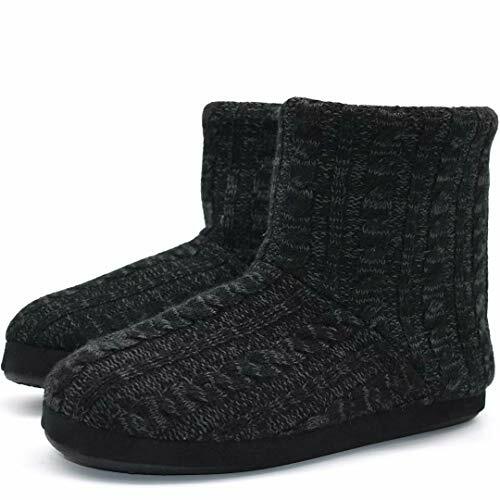 SNUG PADDED UPPER - cashmere woolen knitted upper is cushioned with highly dense cotton liner, making it resilient and stretchy. The flexible upper can accommodate your feet better without tightening or pressing your feet, and give you a cloud-like comfort with every step you take. Side open cut makes it easy to pull on and off. Cozy floppy liner provides 360°warm. Breathable overlays and lining absorb moisture or sweat and release odor to keep your feet comfy and dry. NON SLIP & SHOCK ABSORBING SOLE - soft peach ski bottom with anti slip grippers promote natural range of motion with stronger traction and frictions. Elastic foam cushioned midsole alleviates shocks together with skin friendly cotton insole. Flat thick bottom equals to ergonomic arch support by offering sufficient energy support, making your walking lightweight and comfortable. Safe and stable motion could be promised as well. Premium outsole never scratches the floor and keep quiet. DURABLE & MACHINE WASHABLE - made of superior ultralight materials with great stretch and softness. Machine washable brings your life more convenient. Delicate stitching and processing are not easy occurring seams or deforms. Wear resistant outsole prolongs life span. UNIQUE & TREND - distinctive open side, bow-knot tassel strings and serration sewing make the slippers cute and elegant. Cable knit upper and foldable fluffy cuff also decorate the stylish booties. A special style mixing with fashion and retro taste. Slip on these classic but new school house shoes and enjoy your casual household time. 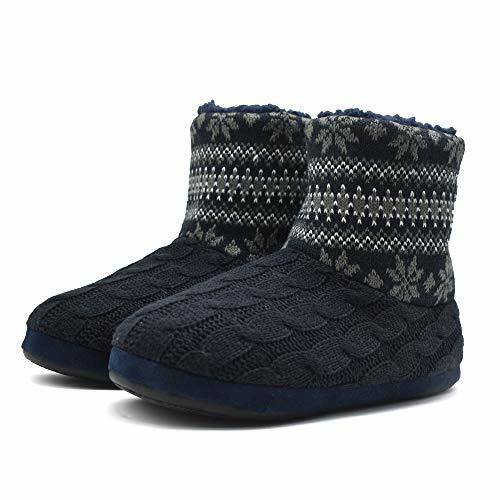 CABLE KNIT PADDED UPPER - woolen knitted upper is thickened with floppy faux fur liner, giving a skin friendly comfort touch. Flexible sweater upper never chafe against your feet so that an ultralight comfy walk would be promised. Breathable velvet and yarn could wick sweat or moisture and release smell effectively to keep your feet comfortable, refreshing and deodorant. NON SLIP & WATERPROOF SOLE - 3 layers of platform sole is made up of elastic rubber outsole, resilient memory foam midsole and fluffy velvet insole, which provides excellent anti shock performance. Deep flex texture adding up grip and frictions gives a safe walk even if you encounter with some shallow water. Cushioned foam tread offers supportive power for different feet parts. Flat bottom promotes stable sense, of which premium materials never scratches the floor or produces noise. DURABLE & LIGHTWEIGHT - selected premium materials are processed delicately and finely, making it no easy occurring seams or deforms. Padded suede on heel back and stretchy upper make it more wear resistant. Pull on these stylish ankle booties and enjoy your quiet household leisure time. 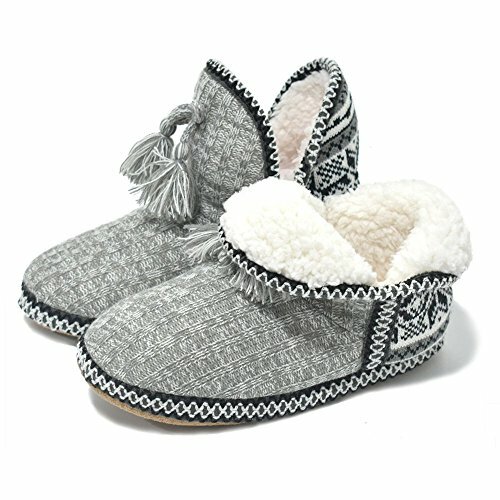 ELEGANT PRETTY SHOES - exquisite braided knit design, retro button decor, open side style, fuzzy full fur liner and furry collar - all of these popular elements make it beautiful and new school. High top style gives your feet really warm. 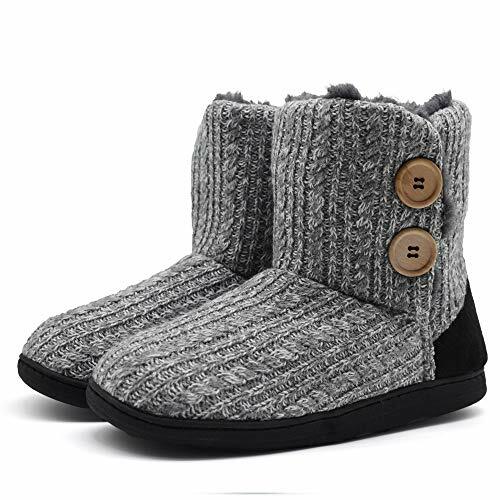 Leading the fashion trends, these cool boot like slippers impress people with classic-casual blended style. APPLICATION - suitable for indoor and moderate outdoor use. Perfect for guest treat, bedroom, sleeping room, living or dining room, hotel, dormitory, spa, steam room. Especially suitable for people with poor circulation in winter or moms in confinement. Good gift choice for Mother's Day, Christmas Day, Thanksgiving Day, birthday. 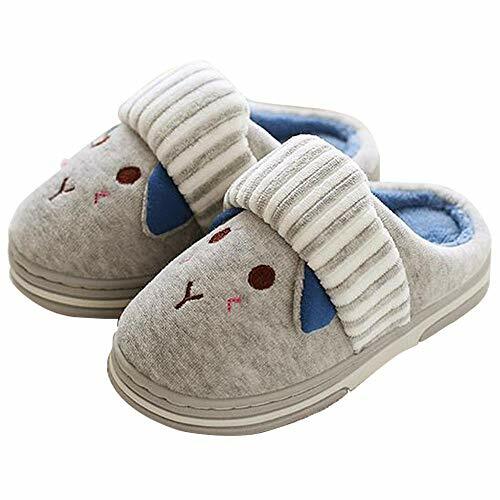 SNUG CUTE UPPER - padded upper is cushioned with dense fuzzy plush liner, keeping your kids' feet 360°warm and giving them a cloud-like comfort with every step they take. Flexible upper can accommodate feet better with strong stretch, which never tightens feet and promises a lightweight and cozy walk. Breathable materials also absorb moisture or sweat and release odor effectively, providing a comfy, refreshing and deodorant environment. ANTI SLIP & WATERPROOF SOLE - elastic TPR rubber outsole featuring great shock absorbing performance alleviates unstable feeling. Platform outsole thickened with resilient memory foam midsole and comfortable floppy velvet insole brings you sufficient energy supplier like arch support. Flat bottom gives you a safe feeling, under which the non skid texture also adds up grip and frictions. Thick soft footbed promises walking safety and provides overall protections for kids. DURABLE & QUIET - ultralight superior materials are processed and stitched delicately, which is not easy occurring deforms or seams. Fuzzy velvet liner offers a skin friendly touch, with no harm for children's tender skin; what's more, soft TPR sole never scratches the floor or produces much noise so as to provide a quiet environment for children. Low top type can avoid falling off or slipping down effectively. Slip on these boots like slippers and enjoy your household leisure time. 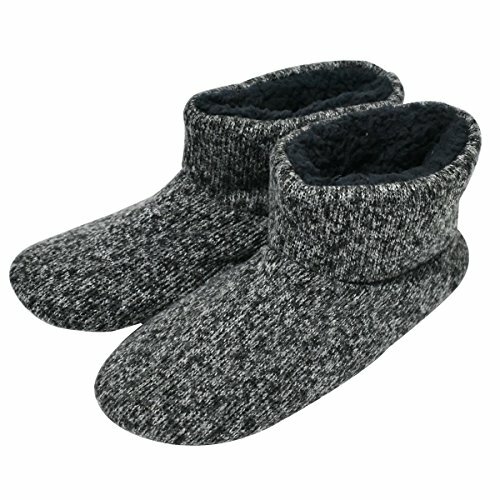 SAFE & FASHION SLIPPER BOOTIES - slip on ankle booties for boys and girls. Low top style brings a real warm and safer walking. 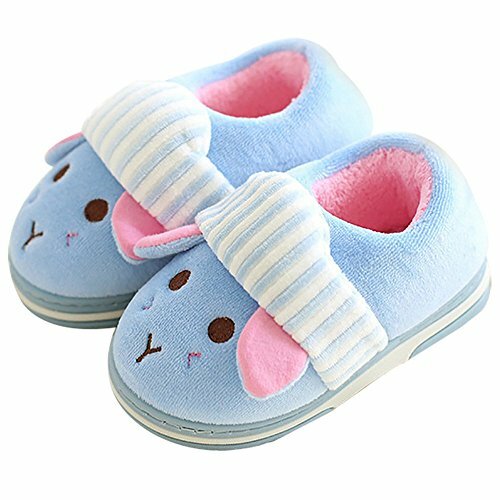 Kawaii ankle slippers, a good company in growing up days for kids. APPLICATION - suitable for indoor and moderate outdoor use. Perfect for open house, guest treat, hotel, dormitory, spa, steam room, bedroom, living dining room, sleeping room, party, office, kindergarten, etc. Good gift choice for Children's Day, Christmas Day, Thanksgiving Day, birthday, etc. Snug 3 layers of padded liner - lining consisting of premium hollow cotton interlayer, thick sherpa fabric and comfortable breathable shu velveteen. All of these offer a cloud-like comfort for you and absorb moisture, sweat and eliminate odor to keep your feet warm,comfy and dry. Anti skid & Waterproof sole: Elastic rubber outsole with deep flex groove outside adds up grip and traction well. Even if you encounter with shallow water the non slip performance could be guaranteed as well. Resilient flatform bottom with arch support gives you a real stable feeling and lightweight safe walking. Soft footbed and outsole prevent scratching the floor and ensure quiet. Convenient & fashion - shaft could be cuffed or unfolded up. Mid calf style makes it easy to pull on and off. Flexible cable knitted woolen yarn upper and floppy liner provide strong stretch for your feet. Perfect for indoor occasions such as hotel, open house, guest treat, living dining room, sleeping room, bedroom. Of course they could be a choice for moderate outdoor use if you persist in. A good daily home company - plush fuzzy liner eliminate your fatigue after a long day work. It's an indeed good partner for people with poor circulation in cold weather and a good gift choice for Christmas Day, Valentine's Day , Father's Day, Thanksgiving Day, birthday, etc. 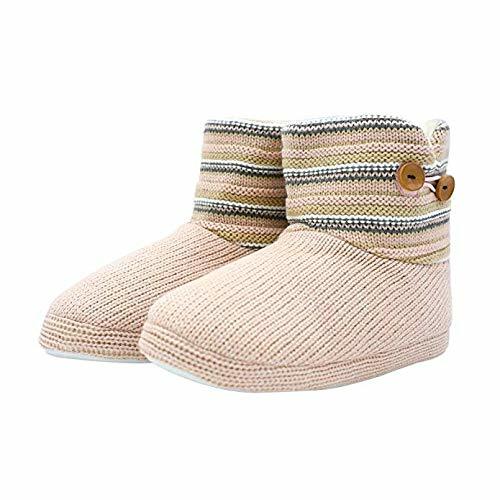 SOFT & COMFY UPPER - terry outside is lined with velvet-cotton blended interlayer, bringing your babies feet a real warm and lightweight walking without leaving any pressures or hurts. Slightly flexible upper could accommodate feet better, stretchy breathable materials keep feet dry, comfortable and refreshing. NON SKID RUBBER OUTSOLE - platform bottom consists of resilient TPR rubber outsole, thickened foam midsole and floppy velvet insole, alleviating shocks and unstable feeling. Moderately elastic foam sole makes walk cozy and ultralight by providing sufficient supportive aiding power naturally. Deep bottom texture adds up frictions and grip so that a safe motion would be guaranteed for your kids. QUIET & DURABLE - premium materials are processed finely. Dense stitching and wear resistant outsole never scratches the floor or produces much noise. It's not easy occurring falling apart or abscission. Fully fulled velvet prevents against chill effectively, and skin friendly touch sense promise health. 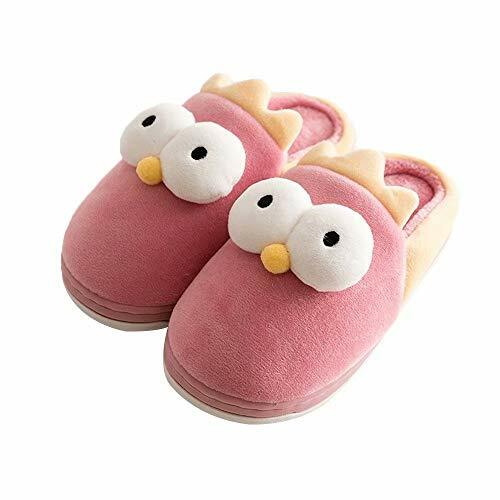 KAWAII ANIMAL SLIDE SLIPPERS - popular retro slippers shape are decorated with cartoon chicken face, bringing kids a good mood after pulling them on. It mixes with classic and trendy style. 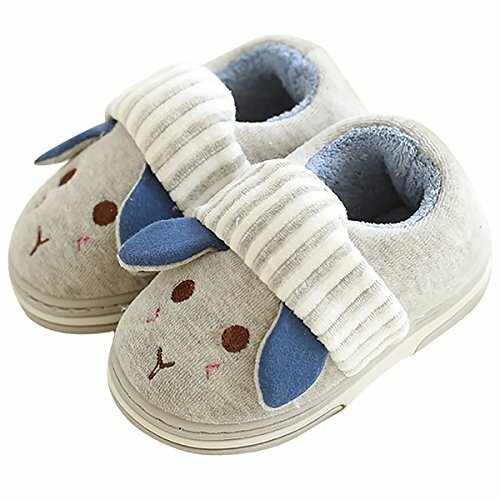 Pretty beautiful household half shoes, a great winter partner for toddlers. APPLICATION - mainly for indoor and suitable for moderate outdoor use. Perfect for open house, bedroom, sleeping room, living or dining room, playground, kindergarten, etc. A gift choice for Children's Day, Christmas Day, Thanksgiving Day, birthday, etc. 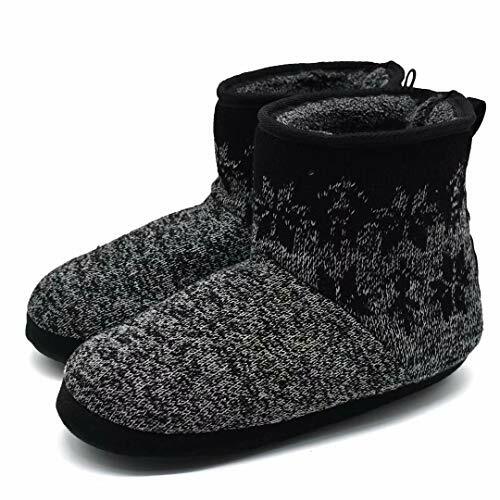 SNUG CUTE UPPER - padded upper is lined with dense cotton interlayer and floppy terry velvet inside, keeping your feet 360°warm and giving you a cloud-like comfort with every step you take. Flexible upper can accommodate your feet better with strong stretch, which never tightens your feet and promises a lightweight and cozy walk. Breathable materials also absorb moisture or sweat effectively to keep your feet refreshing, deodorant and comfy. ANTI SLIP & WATERPROOF SOLE - elastic TPR rubber outsole featuring great shock absorbing performance alleviates unstable feeling. Cushioned outsole thickened with resilient memory foam midsole and comfortable floppy insole brings you sufficient energy supplier like arch support. Flat bottom gives you a safe feeling, under which the non skid texture also adds up grip and frictions. Thick soft footbed promises walking safety and provides overall protections for kids. DURABLE & QUIET - ultralight superior materials are processed and stitched delicately, which is not easy occurring deforms or seams. Fuzzy velvet liner offers a skin friendly touch, with no harm for children's tender skin; what's more, soft TPR sole never scratches the floor or produces much noise so as to keep a quiet environment for kids. Low top design makes booties like slippers easy to pull /slip on and off. 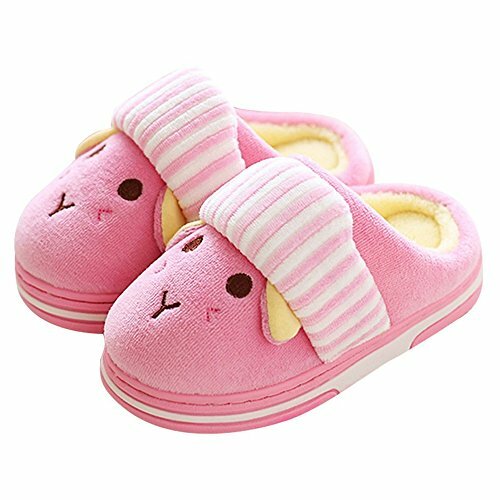 SAFE & FASHION SLIDE SLIPPERS - kawaii cartoon rabbit with attractive smile brings toddlers good moods all day and makes them love walking when they slip or pull on them. Stripes hat and big ears decors make it more pretty and popular. Mixing with retro casual slippers shape and trendy elements, a combination of classic and stylish style. An intimate design of resilient ankle short pile for the 2 least small sizes to fix the slippers and avoid slip down or fall off. NOTICE: Washed after drying, away from fire. Please NOTICE that our size is smaller. Please add 1 size up when you place an order. 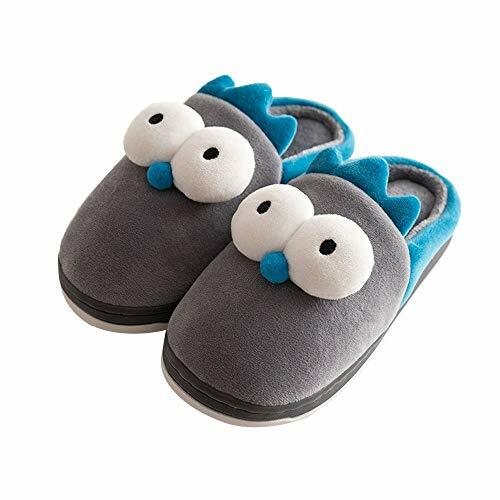 SAFE & FASHION SLIDE SLIPPERS - kawaii cartoon animal (rabbit) with attractive smile brings toddlers good moods all day and makes them love walking when they slip or pull on them. Stripes hat and big ears decors make it more pretty and popular. Mixing with retro casual slippers shape and trendy elements, a combination of classic and stylish style. 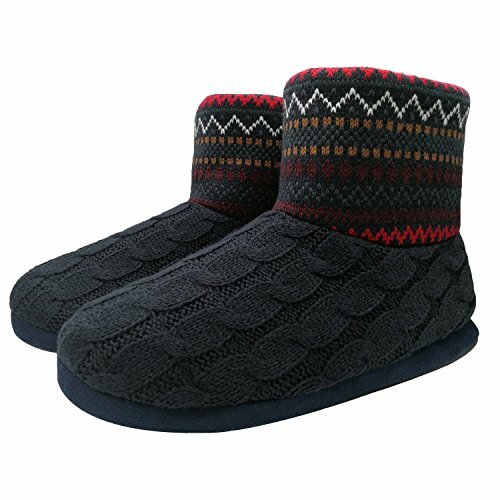 An intimate design of resilient ankle short pile for the 2 least small sizes to fix the slippers and avoid slip down or fall off.